I told ya I'd block a sock. Well, I blocked two. Since the socks were knit on two different sizes of needles, I had to block one smaller and the other had to be blocked larger. Which is which? I'm sure you can tell but I think they both came out nicely. What? You need to look closer? Click here to get a good eyeful. The left one was knit on US #2's, right on US #3's. I did do a few hot water washes with the larger sock and found out that this Gems Merino yarn does bleed when in hot water. Not that I expected it to be pristine (doesn't bleed in cold, btw) but as superwash wool, I really didn't expect it to need two or three rinses to run clearer. Not clear. But less of a problem. I'll be sure to warn my pal that the yarn may bleed if she washes them in hot water. Slow yarn crawl reveal- I brought back a few hundred yards of wound-from-coned Zephyr which total about 600 yards in only two ounces1. It was a steal, I tell you! Springwater Fiber is only a few blocks away from Knit Happens and had a lovely little cone forest in the back of their shop. It wasn't just wool cones either. Let me see a cone of yarn and you'll get a very happy freecia. There's just something lovely about good yarn on a cone (not to be mistaken as a cone of rug wool- ugh) that makes me smile. How Happy? Princess Leia Happy It probably has to do with the bargain and one long piece of yarn. I could argue for loving balls of yarn- like a cute little pet, but cones are a big honkin piece of love. Weaving Works has a full cone forest. So sad I don't have a cone forest of hand-knittable yarns in one of my LYS. There's a weaving shop which does carry weaving yarns but not much for hand-knits. Now- what to make with the Zephyr? Socks? Shawl? So soft. pulled from elann.com "once sold" list. Continue reading Not a Victim of One Sock Syndrome. Don't you wish I had one of them newfangled cameras that also takes movies? I do, then you could see silly little me shuffling across our hardwood floors doing a sock dance. They fit perfectly with a bit of room for my toes to wiggle which is just the way I love them. Plus, note the ribbing on top fits my plump white leg very comfortably. Thanks Kat! Awesome job and despite what you say, I don't see any holes! Not even in the instep which is where mine always always appear. Don't even make me show you how I decided to seam up the picked up instep with a crochet chain since the holes on the second sock were making me despair. 'Scuse me while I take my tootsies out for a dance. And oh, no, the wonky lotus pose with my legs doesn't hurt. I took the sock to knitting group last night and asked for expert opinions- their expert conclusion- I'm nutty. It looked fine. Maybe even good. Okay, so I might be slanting their comments a bit, but they said it was nice and they couldn't see any of the errors other than loose stitches. Note to self- Petticoat sock ribbing hides errors nicely. There are some loose stitches I'll have to distribute out but they think I should go onward. So. Onward I go. Just, next time I make these socks- a) the 52 stitch repeat is TINY. I'm told a thicker yarn would have been better, like sportweight. 60+ stitches cast on is much more normal. => b) Would probably use 3mm needles for the current yarn- Louet Gems Merino. So chalk it all up to experience! I was too ignorant to know better. Now, how do I shrink this sock? It is superwash so will it still shrink a bit if I wet it down and toss it into the dryer on high for a few minutes? The second sock is halfway done but honestly, I don't like it. I went up to US #3's since Holly and I figured that was what was needed to get closer to gauge. And it is. But after finishing the entire leg and heel (with copious mistakes- this should have alerted me when I didn't want to go back and change them) that I didn't really like the openness of it. So, dear sock pal, you may get one sock, a ball of sock yarn, and a note that says the second sock will be coming shortly. Or something like that. I really don't want to delay mailing her socks but what knitter wants to receive a substandard sock?! Not only do I think I should feel terrible about giving her one crappier sock (I should, but right now I'm hopped up on Chinese food and aparthy for the ugly sock) but I think she'd feel sad at receiving a sock which she could have done a better job on herself! So, I'm going to sleep on it and if I can manage to find those #2.5 that I originally have but have stuck somewhere in packing frenzy, will rip it out tomorrow morning. Or just break down and buy another set. Urgh. It feels so silly to buy another set when you have a set but just can't find it. I'm trying not to take the easy road. I really wouldn't be proud to give her this sock, even if I may be really happy about finishing it. Yes, there is the deadline, but really, would you prefer a bad sock? I wouldn't. I do expect the 2.5's to work out okay as long as I block the sock after. But the current state of the sock with the open weave-i-ness would require some blocking, too. Almost to the toe! 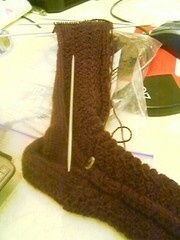 I can't even explain how excited I am that this sock is almost finished. Please excuse the bad quality of phonecam pic but I was just too excited. I think I'll knit up the toe tomorrow morning! It is so long and skinny that I can only thank the foresight of the pattern author (Veronik Avery) to recommend Louet Sales Gems Merino 'cause I'm going to have to block this sock. I think I will probably stop in at Knit Happens or StitchDC to possibly get a 3mm dpn set Tues. or Wed in hopes that it will cure this skinny syndrome. The best solution for the exisitng sock is probably going to be a vicious hard-core block the sock in order to get it to a wearable width. I'm quite sure, thank you, that my pal does not have a 6" foot circumference. And what does a knitter do with a huge stretch of plane time before her? Work on a sock, of course. Sock on a Cup. We have a heel, too, but really, it isn't so interesting and doesn't merit a separate photo. Well, I'm off to bed since it is midnight here in DC where I'm visiting a friend and I plan to take on the monuments early tomorrow. Sock, meet monument. Monument- Sock. Toodles! BTW, the fear that the socks will not be completed by the deadline has now set in. I think I'll need to visit a yarn store to procrastiknit and deny the possibility that there won't be a time warp in my favor before next Tuesday. For those of you who haven't seen the give a little fund-raising campaign please take a look. This is an appeal to you to give what you can to the Red Cross or other charity oranizations who will help Katrina vistims with the basics of life. You can donate on-line or call 1-800-HELP NOW. Let us know what you have donated to Katrina Aid through the American Red Cross (we recommend the Disaster Relief Fund) at this email address: givealittle@gmail.com. Please put your name and the amount donated in the subject line. We'll keep a tally on our sidebars so that you can watch the dollars grow. Each Friday we'll annouce a winner or two (or three) for the prizes you see on this page. I'll be giving a Japanese craft magazine. Actually, I'll be taking the winner's choice of style- hip, traditional, lace, crochet, sewing, etc- and going to the store to pick one out. If you've been hankering after one of these, here's a way of getting one. (Donate anyway, please, but if you need incentive, here is one). Knitting huricane survivors who lost stash- I open my stash to you. I know that you need other items much more right now. You have other things you're worrying about right now. But. If I can help in this way to alleviate a bit of your loss, please please, let me do so. Quilters are sending bed linens to Texas. Please note: for security, do NOT use the word 'quilt' ANYWHERE in your address label! They're also matching donations, so please also send an e-mail to them, your company, and anyone else who will match a donation. We will match EVERY donation made by quilters to the American Red Cross, up to a maximum of $10,000, on a dollar for dollar basis. In other words, if you make a $25 donation, we'll match that with another $25 donation. If you make a $100 donation, we'll match that with another $100 donation, right up to the maximum. To avoid delays in your donations reaching the Red Cross, and because we have trusted quilters for more than 30 years now, just email us with the amount of your donation that you sent to the American Red Cross Disaster Relief Fund. Every penny of every donation--up to $10,000--will be matched by International Quilt Festival. You have my word on that. Please use this email address: exec5@quilts.com and use the subject line: RED CROSS DONATION. Send clean bedding. I, queen of nappy time, blaaaaanket, and beeeeeed, definitely have some extra sheets I'll be washing and sending out on Tuesday (since there's no mail tomorrow or Mon.) Fleece blankets are good, too. This page is a archive of entries in the sharp points category from September 2005.
sharp points: August 2005 is the previous archive. sharp points: October 2005 is the next archive.